Oxidizers, Enclosed Flares and Scrubbers treat and remove harmful chemical and gas residue from processing exhaust streams. Petrochemical and Oil & Gas processing generates exhaust streams laden with potentially harmful chemical and gas residue. Chemical Scrubbers, Enclosed Thermal Flares and Thermal Oxidizers are used to remove the residue from the exhaust. Pollution Systems has a full line of scrubbers and oxidizers specifically designed to remove the particular chemical or residue waste generated by each facil-ity's process. Chemical/Gas Scrubbers remove petrochemical and gas residue in exhaust vapors. Cleaning liquids are injected into the scrubber and mixed with the exhaust vapor. The required contact time needed between the vapor and cleaning fluids is determined based on the pollutant in the vapor that needs to be removed, its concentration in the exhaust and the desired removal efficiency. Typically, an acidic or basic solution is recirculated in the scrubber depending on the pollutants targeted for treatment. With destruction rates over 99%, these scrubbers produce clean exhaust for release into the atmosphere. Recuperative Oxidizers are most effective for exhaust streams containing Volatile Organic Compounds (VOCs) and particulate concentrations that would foul other types of air pollution control equipment. The oxidation process uses combustion to destroy the pollutants and can achieve destruction rates over 99%. Energy from the discharge of the oxidizer chamber is used to preheat the incoming process gas. Our recuperative oxidizers are designed for long-term operation and to facilitate maintenance. Enclosed Flare Thermal Oxidizers are used to treat high VOC exhaust streams. Enclosed flares offer demonstratable, high destruction rates at greater than 99% and have no visible flame compared to traditional flares. 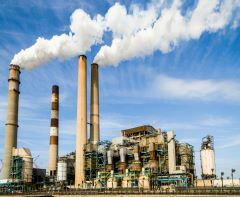 Catalytic Oxidizers are used with low, stable VOC concentrations, and are used to treat petrochemical process exhaust streams that do not contain high levels of particulate nor poisons. Pollution Systems’ custom designs can provide you with a Chemical/Gas Scrubber or Thermal Oxidizer for your Petrochemical Processing application. Our expert design staff will work closely with you to design an energy-efficient, reliable and long-lasting emissions control system.